The first presidential portraits created from 3-D scan data are now on display in the Smithsonian Castle. 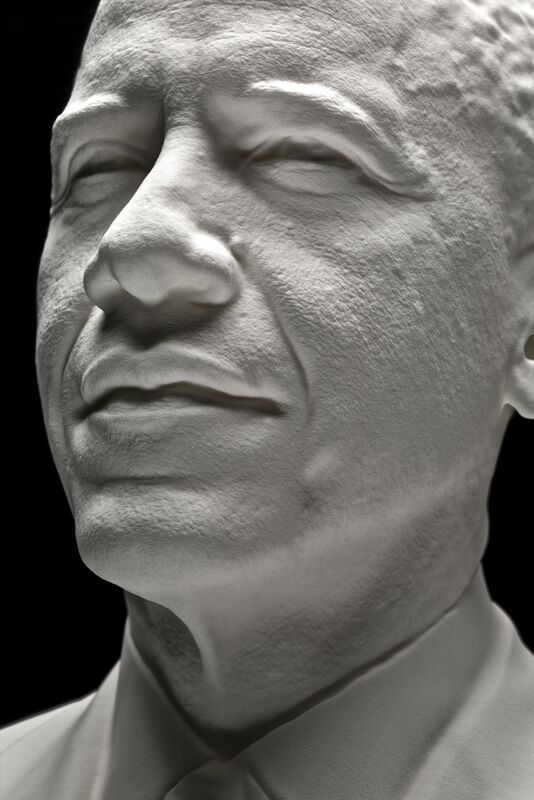 The portraits of President Barack Obama were created based on data collected by a Smithsonian-led team of 3-D digital imaging specialists and include a digital and 3-D printed bust and life mask. A new video released today by the White House details the behind-the-scenes process of scanning, creating and printing the historic portraits. The portraits will be on view in the Commons gallery of the Castle starting today, Dec. 2, through Dec. 31. The portraits were previously displayed at the White House Maker Faire June 18. 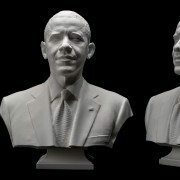 The Smithsonian-led team scanned the President earlier this year using two distinct 3-D documentation processes. Experts from the University of Southern California’s Institute for Creative Technologies used their Light Stage face scanner to document the President’s face from ear to ear in high resolution. Next, a Smithsonian team used handheld 3-D scanners and traditional single-lens reflex cameras to record peripheral 3-D data to create an accurate bust. The data captured was post-processed by 3-D graphics experts at the software company Autodesk to create final high-resolution models. The life mask and bust were then printed using 3D Systems’ Selective Laser Sintering printers. The data and the printed models are part of the collection of the Smithsonian’s National Portrait Gallery. The Portrait Gallery’s collection has multiple images of every U.S. president, and these portraits will support the current and future collection of works the museum has to represent Obama. The life-mask scan of Obama joins only three other presidential life masks in the Portrait Gallery’s collection: one of George Washington created by Jean-Antoine Houdon and two of Abraham Lincoln created by Leonard Wells Volk (1860) and Clark Mills (1865). The Washington and Lincoln life masks were created using traditional plaster-casting methods. The Lincoln life masks are currently available to explore and download on the Smithsonian’s X 3D website. The video below shows an Artec Eva being used to capture a 3D portrait of President Barack Obama along with Mobile Light Stage – in essence, eight high-end DSLRs and 50 light sources mounted in a futuristic-looking quarter-circle of aluminum scaffolding. During a facial scan, the cameras capture 10 photographs each under different lighting conditions for a total of 80 photographs. All of this happened in a single second. Afterwards, sophisticated algorithms processed this data into high-resolution 3D models. The Light Stage captured the President’s facial features from ear to ear, similar to the 1860 Lincoln life mask. The Smithsonian publicly launched its 3-D scanning and imaging program Smithsonian X 3D in 2013 to make museum collections and scientific specimens more widely available for use and study. The Smithsonian X 3D Collection features objects from the Smithsonian that highlight different applications of 3-D capture and printing, as well as digital delivery methods for 3-D data in research, education and conservation. Objects include the Wright Flyer, a model of the remnants of supernova Cassiopeia A, a fossil whale and a sixth-century Buddha statue. The public can explore all these objects online through a free custom-built, plug-in browser and download the data for their own use in modeling programs or to print using a 3-D printer. The conference kicked off this morning with some great presentations including a live preview of Cyclone 7.2 and its new pcE high speed visualization engine. 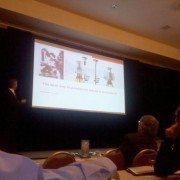 – Ken Smerz, Kovach Construction/Precision 3D Scanning, gave an excellent presentation on the benefits of laser scanning for the precise fabrication of complex wall systems. – Alan Barrow, ABA Surveying, showed how he is using 3 HDS6000’s, a LandINS IMU and Javad GNSS mounted on the back of a van for near survey-grade mobile scanning. – Luncheon keynote updating us on the status of the Mt. Rushmore CyArk project was given by Liz Lee and Doug Pritchard. They showed some remarkable images of the project. – Zebra Imaging is displaying their latest high-resolution, full-color holographic prints in their booth. They have some great examples of full-color point clouds and detailed Building Information Models. The day ended with a great social evening of food and bocce at Campo di Bocce Ristorante & Bar. We are looking forward to more great presentations over the next couple of days. Be sure to follow us at www.twitter.com/scanable for live updates throughout the event. SCANable is an organization committed to providing valuable information and resources related to the 3D Laser Scanning, LiDAR and Mobile Scanning industries in order to increase the awareness of the benefits and capabilities of these technologies. We strive to provide the necessary tools and support to further enhance the state of these industries including on-line laser scanner equipment rental through our Preferred Provider program (Leica, Z+F, FARO, Riegl, Trimble and Topcon). We are working with our partners across the nation to provide price consolidation and standardization of laser scanning equipment rentals with a commitment to provide the highest quality products and absolute excellence in service. Our goal is to build lasting customer relationships and ultimately, to be the most valuable resource for the entire industry. Our organization will prove to be a valuable resource. However, your input and contributions will help to further enhance the awareness of our industry. If you are interested in increasing the exposure of your company, please fill out the Business Directory form. If you are interested in contributing articles relative to this site, please register for a free account here. Upon approval, you will have access to this site. If you don’t have time to commit to writing articles for this site, you can also send news tips or article ideas to info@scanable.org. The Autodesk® Subscription Advantage Pack for AutoCAD® Civil 3D® 2010 provides new functionality for importing and visualizing point clouds and designing roundabouts, and powerful enhancements that can help streamline existing workflows in AutoCAD® Civil 3D® 2010 software. This pack also includes Autodesk® ImageModeler™ 2009 software. 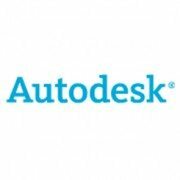 This Subscription Advantage Pack is available exclusively for Autodesk® Subscription customers through download in the Autodesk Subscription Center. Some common uses of LiDAR data in AutoCAD Civil 3D 2010 may include using the point cloud data for site surveys, developing an understanding of the site context, and digitizing as-built features (for example, building footprints and curbs) for design projects. Agencies have launched social networking applications at such a fast pace that government officials said on Friday that they plan to add more applications, such as Apple’s popular media store iTunes and the career-networking site LinkedIn. The government also is negotiating agreements with social publishing site Scribd and commenting platform Intense Debate, said Martha Dorris, acting associate administrator for the General Services Administration’s Office of Citizen Services and Communications. The federal government has signed modified terms of service agreements to allow agencies to use social media sites Flickr, Facebook, YouTube, Vimeo, Slideshare and AddThis, among others. The response to the agreements has been excellent, Dorris said. Agencies have set up Facebook profiles, Twitter accounts and YouTube channels to share information with the public. “We’re looking at taking information wherever citizens go to get information,” she said, adding GSA will consider adding more social networking sites, depending on requests from agencies. Sheila Campbell, team leader of best practices for USA.gov and co-chairwoman of the Federal Web Managers Council, said tools such as Twitter offer the government the ability to communicate with the public very quickly in times of emergency. She cited as examples the Center for Disease Control and Prevention’s use of social media during its peanut recall and the swine flu outbreak. Despite the common perception that social media tools are used mostly by younger users, baby boomers are the fastest-growing segment of users for most applications, according to Dorris. She said agencies were inspired by President Obama’s use of new media tools during his campaign and by WhiteHouse.gov, and have applied those lessons to outreach programs. When asked how agencies can move beyond simple broadcast of information to using social media to collect feedback, Dorris said Obama’s recent request for public input to support his open government initiative is an example. She said requests for public comments on health care and the recovery act were other examples. GSA general counsel Seth Greenfield said any new social media policies would only complement existing ethical standards and regular use policies being applied to the use of IT. By combining the best of two different distance measurement approaches with a super-accurate technology called an optical frequency comb, researchers at the National Institute of Standards and Technology (NIST) have built a laser ranging system that can pinpoint multiple objects with nanometer precision over distances up to 100 kilometers. The novel LIDAR (“light detection and ranging”) system could have applications from precision manufacturing lines on Earth to maintaining networks of satellites in perfect formation, creating a giant space-based platform to search for new planets. LIDAR transmits light through the air and analyzes the weak reflected signal to measure the distance, or range, to the target. NIST’s new LIDAR, described in Nature Photonics,* has a unique combination of capabilities, including precision, rapid updates from multiple reference points at the same time, and minimal “measurement ambiguity.” The system can update measurements to multiple targets simultaneously every 200 microseconds. Measurement ambiguity in a LIDAR system is due to the fact that, if the target is at long range from the instrument, the system can’t distinguish between two different distances that are multiples of its “ambiguity range.” The new NIST LIDAR has a comfortably large ambiguity range of at least 1.5 meters—large enough to check the coarse distance with widely available technologies such as GPS. No other ranging system offers this combination of features, according to the new paper. NIST’s LIDAR could enable multiple satellites to maintain tight spacing and pointing while flying in precision formations, acting as a single research instrument in space, the paper states. Formation flying has been proposed as a means to enhance searches for extraterrestrial planets, enable imaging of black holes with multiple X-ray telescopes on different satellites, and support tests of general relativity through measurements of satellite spacing in a gravitational field. The new LIDAR could enable continuous comparisons and feedback of distances to multiple reference points on multiple satellites. There also may be applications in automated manufacturing, where many parts need to fit together with tight tolerances, according to Nate Newbury, the principal investigator. NIST’s LIDAR design derives its power from combining the best of two different approaches to absolute distance measurements: the time-of-flight method, which offers a large ambiguity range, and interferometry, which is ultraprecise. The LIDAR relies on a pair of optical frequency combs, tools for precisely measuring different colors (or frequencies) of light. The frequency combs used in the LIDAR are based on ultrafast-pulsed fiber lasers, which are potentially smaller and more portable than typical combs that generate laser light from crystals. The two combs operate at slightly different numbers of pulses per second. Pulses from one comb are reflected from a moving target and a stationary reference plane. The second comb serves as precise timer to measure the delay between the reflections returning from the target and from the reference plane. A computer calculates the distance between the target and the reference plane by multiplying the time delay by the speed of light. * I. Coddington, W.C. Swann, L. Nenadovic and N.R. Newbury. Rapid, precise absolute distance measurements at long range. Nature Photonics. Published online May 24, 2009.